Calling Graveyard a throwback band in the vein of Witchcraft is a bit of a misnomer, given the founders of both bands include former Norrsken members. Vocalist Joakim Nilsson just took a longer route than Magnus Pelander, launching the bluesier rock band called Albatros with bassist Rikard Edlund first. When Albatros broke up, it gave Nilsson and Edlund every reason to get back to their dirty 1970s hard rock roots along with Axel Sjöberg. 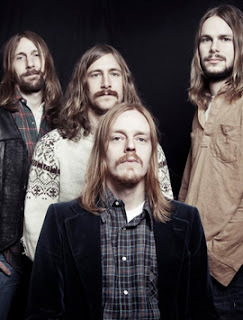 Add in guitarist Jonatan Ramm, who replaced founding member Truls Mörck, and Graveyard would settle into a vibe not all that far removed from classic rock but with metal, blues and psychedelic influences, many of them from the seventies. Lights Out brings the lights up on Graveyard. As the third album from the band hailing from Gothenburg, Sweden, Lights Out finds them much more comfortable and confident in the music. The evolution has a lot to do with focus. Since the release of their Hisingen Blues last year, the band finally earned enough to make music their full-time focus. There was no rush. Where this becomes most evident is in the lyrics. Starting with the track released in advance of the album, the band quickly established that they found a bridge between everyday life and the dreary doom-laden proposition that it's all made up. The have-lots have sold the have-nots on slavery by giving them a fake sense of freedom. Backed up by solid instrumental and a few choice rolling riffs, Goliath is deliciously vicious as an introduction. Nilsson too. He sounds especially great on what recreates that "best played with the top down" sound that was much more indicative of the seventies than it is today. The opener on the album is equally pointed but more laid back in its blues-infused delivery. And Industry Of Murder paints the picture that people are being played. But unlike Goliath, the song alludes to the idea that it will eventually change. History says as much. Not everything on the album is politically motivated. Seven Seven carries some potent guitar work. Hard Times Lovin' highlights the band's continuing passion for blues in a smoky and smooth ballad. 20/20 (Tunnel Vision) contains some of the band's best lyrics as Nilsson and company prove once again that they have diversity under the hood. "Ain't a light in my tunnel, but the gold tooth in the devil's smile," Nilsson laments while he tells the tale of a man trudging through life. "I walked a wide road a thousand times. You never let me anywhere." Two of the finest tracks on the album are tucked in on either side of the middle. Endless Night is a driving track that rivals Goliath in it tenacity. It's a hard luck story that shares a frequent thread of illusions and charades. Except this time, the emphasis in on the individual. It's about going to war with oneself — who we are and what we let other people see. The other track, Fool In The End, is a more mature offering. It's almost a lament in that it says that most of the things people fight for all their lives are proven a waste of time much later in life. The sound remains grounded with the regret soaked realization that the best dreams aren't always meant to be achieved because it all feels foolish once you reach them. Lights Out By Graveyard Lights Up 5.8 On The Liquid Hip Richter Scale. What really makes Lights Out memorable is that many of the songs have an impact without be saddled by any gadgetry. It's pure rock without any frills or special effects. They don't go out of their way to distort their guitars or toss in some keys. While there is a throwback element to everything they do, Graveyard also takes care to ensure their music still sounds as fresh as if they had followed acts like Black Sabbath. Some people may say that stylistic overture is best left to the past, but Graveyard makes a case that it isn't. I can almost hear their fourth album already. Lights Out by Graveyard is available from Amazon. You can also order the vinyl edition from Barnes & Noble or download the album from iTunes. Fans will likely want the entire album, especially as it gathers praise. But for anyone discovering Graveyard for the first time, start with the more predictable but intense Goliath and Endless Night. Then give the whole analog album a revisit once those sink in.